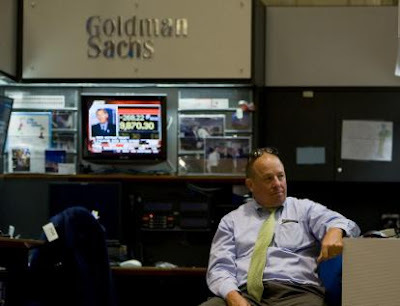 Goldman Sachs is often used as the poster child for some of the most egregious practices on Wall Street that are believed to have set off the current economic crisis now sweeping much of America and Europe. This sentiment was summarized in an article Matt Taibi wrote for Rolling Stone Magazine as follows: "The world's most powerful investment bank is a great vampire squid wrapped around the face of humanity, relentlessly jamming its blood funnel into anything that smells like money." Taibi's criticism of Goldman Sachs immediately drew charges of antisemitism from some American Jewish leaders. And as the "Occupy Wall Street" movement gathers momentum, similar charges are now flying against the protesters who are joining this movement. Some of the Jewish media outlets, like Yeshiva World News, are using video footage of individual protesters to editorialize the claim that “many Jews” are feeling a bit uncomfortable with the growing protests. I, for one, do not believe that the protests are motivated by antisemitism, and such charges are a great disservice to ordinary middle class Americans who have been forced to take to the streets. From what I can tell, "Occupy Wall Street" appears to be a genuine grass roots movement that stems from a sense of deep dissatisfaction with the way the majority of American politicians of all parties have aided and abetted in the misdeeds committed by the big Wall Street firms. Some of these misdeeds have been laid bare by a number of authors, including Michael Lewis most recently in his two books on the subject. The actions of Goldman Sachs and other big Wall Street firms have led to massive job losses, growing homelessness, and deep concerns among middle class Americans about their own future and the future of this country. A similar situation is now gripping Europe as well. I think President Obama should seize this opportunity to tap into this anger and use it to push new legislation to bail out the middle class and put an end to the excesses committed by the big business including the Wall Street banks and their highly-paid executives.